The Guide to Get Rich: Peaks and Valleys... It's All About Your Attitude! Peaks and Valleys... It's All About Your Attitude! 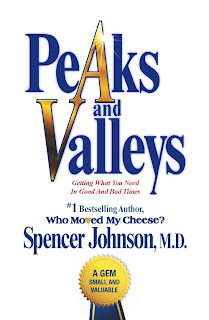 The book of the week was Peaks and Valleys by Spencer Johnson, M.D. Another great book by the same author of Who Moved My Cheese? and The One Minute Manager. This particular book is about making the good time last longer and learning from the bad times quicker. Johnson likes to tell parables to make a point and so far none of these stories have disappointed me. This particular story was about a boy that lives in a valley (bad times) that looks up and sees a peak (good times) and dreams of being there. One day he takes the walk up and meets a old man. That old man gives him sage advice on how to manage his peaks and valleys. The boy uses this advice and after a couple visits changes his life dramatically. It is important to know that everyone goes through peaks and valleys in their life. The factor that determines how long we stay in one or the other is how we use our time. For example if you are in a valley, you can use your time to analyze what got you into that valley and do the opposite to get you back towards a peak. If you are on a peak, and brag to all your friends and family about the good in your life and could potentially push them away and land yourself down in a valley again. The peaks and valleys are important in our life because they help us learn and they give us something to strive for. The book offers 5 lessons to effectively use peaks and valleys at work and in your personal life. 1. Make Reality Your Friend- Look for the truth in the situation... Find out why you are in your peak or valley. When you know what is keeping you there, you can manage behaviors to get you where you really want or keep you where you are. 2. Find and Use the Good Hidden in a Bad Time- In every bad time you should be able to learn. If you learn what you are supposed to, you won't find yourself in that same situation again. Additionally, the sooner you learn what you need to, the sooner you will be able to get out of your valley. 3. Appreciate and Manage Your Good Times Wisely- Be humble and grateful. Find out what got you to your Peak and do more of it. And while you are on top, save resources for your upcoming valleys. 4. Follow Your Sensible Vision- This is goal setting. Imagine yourself, with incredible detail, where you want to be. The exact situation... Sipping Margaritas on your 52' yaht on the coast of Florida. Imagine what the air smells like, the heat of the suns rays. If you do this regularly, you will soon be doing that. Read my blog on The Magic of Thinking Big by David Schwartz, once you see yourself doing something, your mind will make subconscious steps toward getting your there. But you must truly believe you can do it! 5. Share it With Others- Very important! Share your knowledge, use every lesson you have learned and teach others so they don't fall in to that particular valley or teach someone how to stay on a certain peak longer so they can feel great longer. Knowledge is a very valuable tool that everyone should share regularly. Peaks and Valleys are a whole lot mental and if what we are feeling is in our mind, it is very controllable. Johnson says we all have those bad times that we say to ourselves, "in a couple months, I am going to look back on this and laugh." Well, why wait. You can look at that "bad" situation and laugh in the moment. Don't let it get you down, don't let it put you in a valley. Everyone makes mistakes, everyone has bad days. But not everyone lets those moments control them. Enjoy every day, no matter what you are doing with a humble, servant attitude. These ideas can also get you ahead in your career too. Imagine you are interviewing candidates for a new position. In this economy, with a 10% unemployment rate in some areas, you have a lot of people that are in valleys. Would you be more likely to give the job to a person that has their head held high, that is positive, and enthusiastic about what the future is going to bring them? Or would you give the position to the person that is really feeling their valley, that complains to people around them about how they don't have this or that? Additionally, this attitude stems into our home life. If someone is optimistic and knows their valley will soon be a peak, they can show strength in front of their family and spread that optimism and happiness throughout their friends and family. The same spread can work with pessimism and anger. If you have the ability to choose your moods, why not choose to be happy? Pick up this book, it makes a lot of sense. I had some great take aways and will continue to manage my peaks and valleys to progress through life with as many peaks as possible. If you have any questions on the book don't hesitate to ask. I would be more than happy to help anyone that wants it. Be 80% Better With 20% of the Effort!